One of the iconic designs of the 20th century is the poster of Uncle Sam that says “I Want YOU for U.S. Army”. Though it’s closely associated with World War II, it was first created during World War I by an artist named J.M. Flagg. But like “The Office”, “House of Cards’ and “The Italian Job” the “Uncle Sam Wants You” poster is a knockoff of a British version. A few years before Flagg made his poster, the British Army commissioned its own design. The original poster, by artist Alfred Leete, featured a black and white drawing of the then Secretary of State for War, Lord Kitchener. 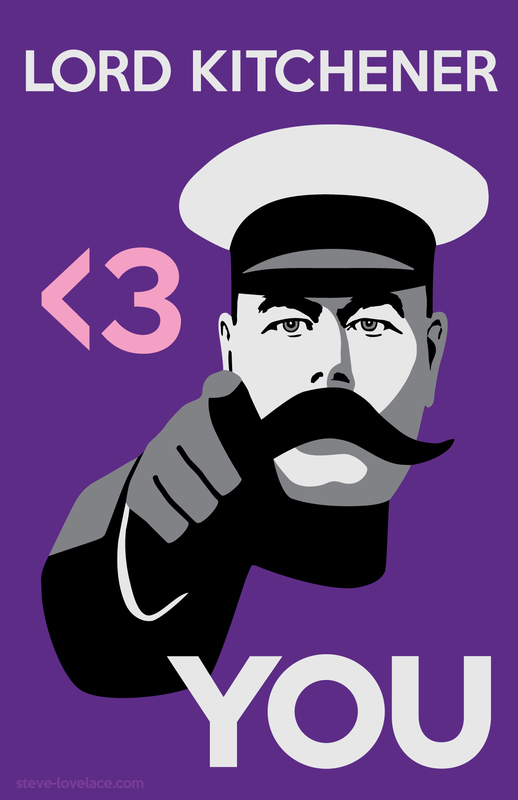 I’m a big fan of the original Lord Kitchener Poster. I like the guy’s giant mustache that would fit in with the hipsters of modern-day Brooklyn or Austin. So I vectorized the image and cleaned it up in Adobe Illustrator. Then I decided to make a more peaceful design. Instead of Lord Kitchener trying to get you to join the British Army, I simplified the message to “Lord Kitchener <3 You”. Then I threw some pink and purple in there for good measure. The result is bizarre, if not baffling, but that’s what happens when you play around with artwork and let the Muse take you wherever your mind might wander. Thank you, Lord Kitchener, for inspiring me to make something silly.